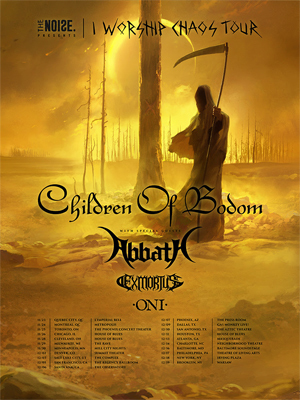 Finnish Metal Superstars CHILDREN OF BODOM will embark on a 21-date North American tour with special guests iconic black metal artist ABBATH, California-based metal act EXMORTUS, and Canada's progressive metallers ONI. The trek, presented by The Noise will commence in Quebec on November 23 and will hit 3 Canadian cities as well as Chicago, San Francisco, New York, and conclude in Brooklyn on December 19th. Alexi Laiho comments, "We're happy to have finally put something cool together for our upcoming US headline tour with ONI, EXMORTUS and the one and only ABBATH so I'd say this tour is more than worth checkin' out! So hope to see you there!" This marks the bands second trek across North America in support of I Worship Chaos which was released last October via Nuclear Blast. COB and Mikko Karmila, who worked with the band on their earlier albums Halo Of Blood, Hatebreeder, Follow The Reaper and Hate Crew Deathroll, produced the album. It was mixed and mastered at Finnvox Studios in Helsinki, Finland, while Finnish artist Tuomas Korpi created the artwork.